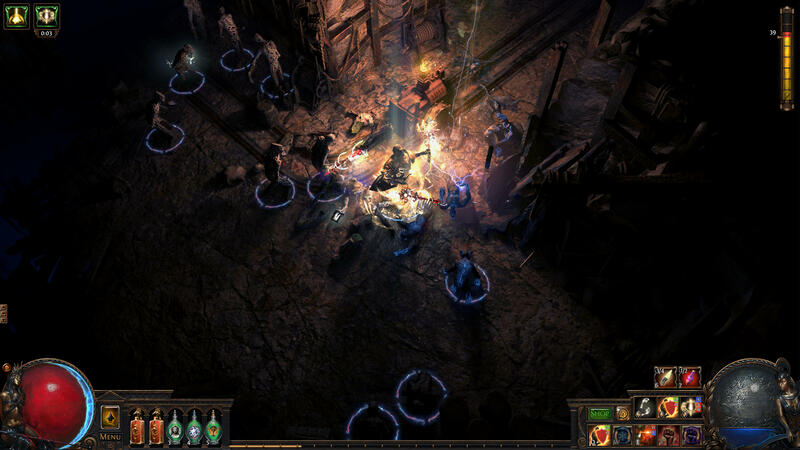 Grinding Gear Games has announced a new expansion and challenge league for its free-to-play action RPG Path of Exile. 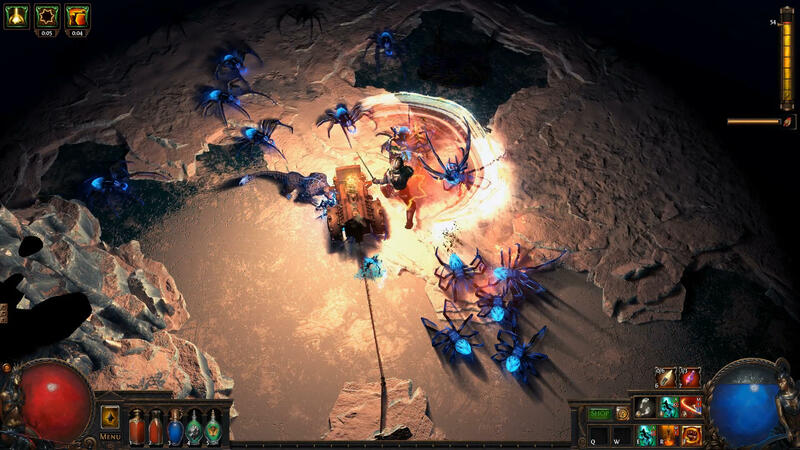 The new content update, titled Delve, sees players entering an infinite dungeon where they compete to reach the lowest levels as the enemies get progressively stronger. Grinding Gear Games’ Chris Wilson gave RPGamer a heads-up on what the new content entails, as well as some other improvements being made to the game. The dungeon itself is called the Azurite Mine, which had previously been exploited for resources but was overcome by an oppressive darkness that kills those with whom it comes into contact, with regular light and fires having no effect on it. However, a new NPC called Niko the Mad has invented something that fends off the darkness and lets players explore the mine and grab its hidden treasures. This comes in the form of a vehicle called the Crawler, which generates a safe light around it, laying down a power network as it goes. 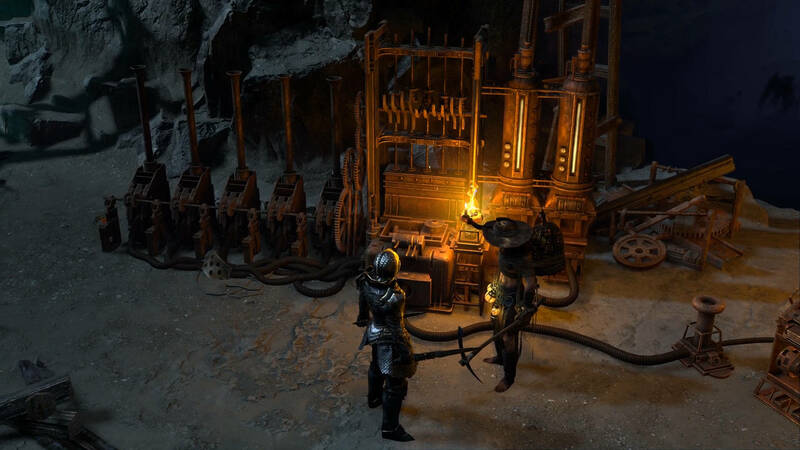 The Crawler is powered by a material called Voltaxic Sulphite, which can be found on the surface, and hence acts as a key that lets players delve into the mine for certain periods of time as they collect it. 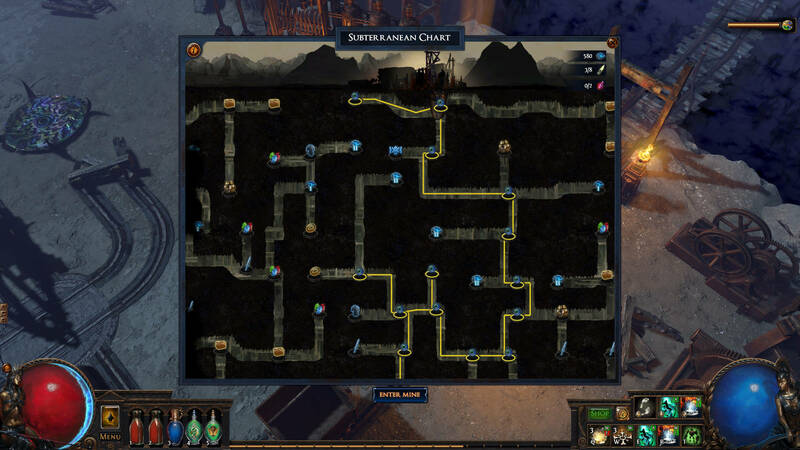 The Sulphite can be stored, so players can choose to either go on quick investigations or hold onto it and gain enough for extended sessions. However, only up to a certain amount can be held so it does need to be used somewhat periodically. 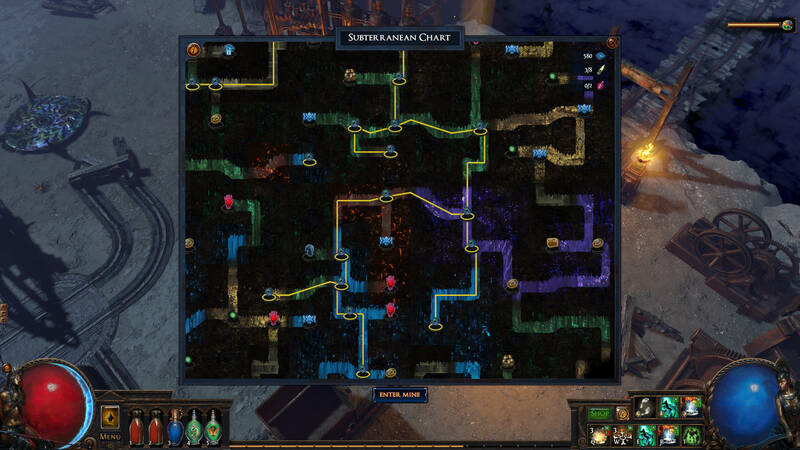 The specific Delve content is available from within the first ten minutes of starting a new character, with the content designed to get progressively harder as players build up their characters. 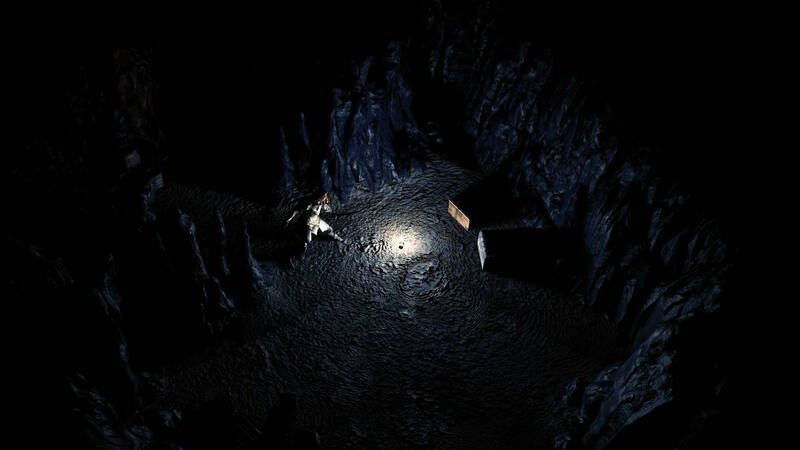 Delves see the Crawler automatically advance through the area, generating a safe lighted radius in the darkness as it goes. If players moves away from the Crawler and into the darkness they will immediately start to take damage that is lethal after just a few seconds. However, just outside of the safety, players will find lots of treasure chests creating a risk-versus-reward dynamic. 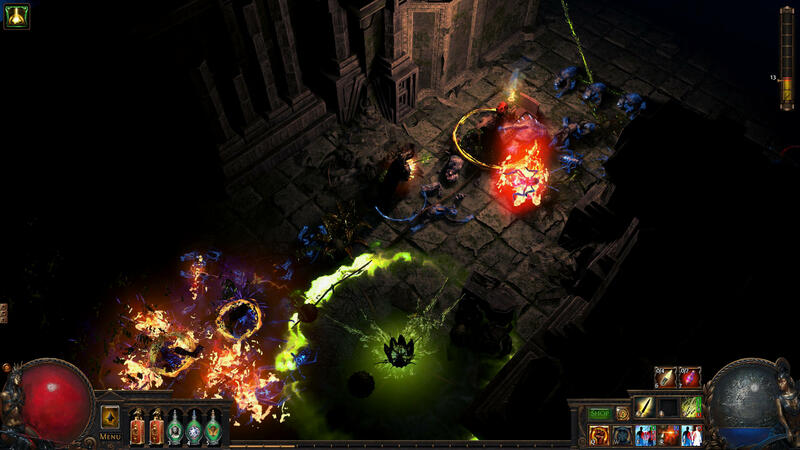 Players will either need to risk stepping into the darkness to grab these chests, or use special limited-use flares to create a temporary extra safe zone. 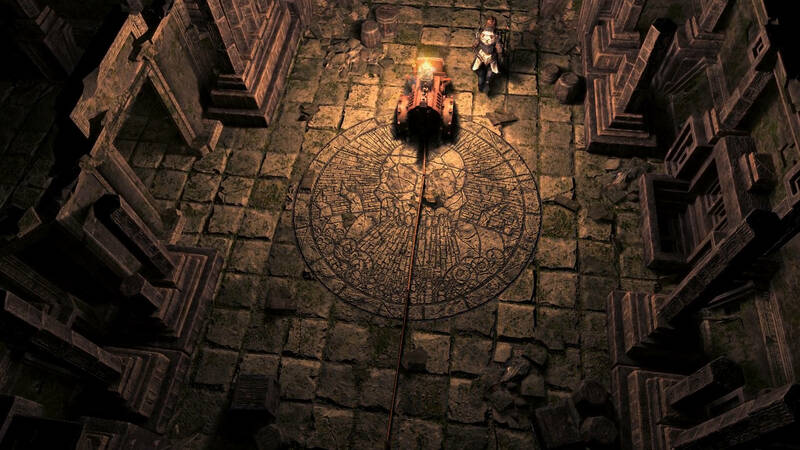 It should be noted that if players choose to step away from the Crawler to investigate, it will slow down, while if they rush ahead it will hasten to catch up with them. 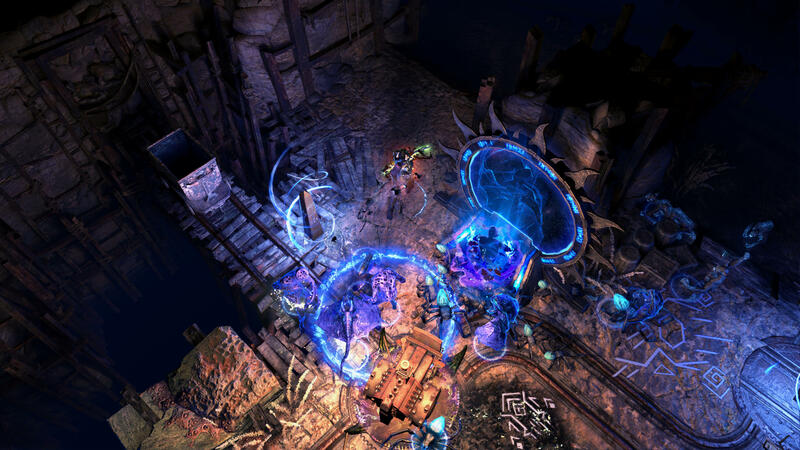 Delves also feature new monsters and abilities to hinder the player, including some that can produce an EMP-style burst that knocks out the Crawler and temporarily stops it from producing light, which leaves players vulnerable to the darkness if they do not have a flare at the ready. The mine is host to a material called Azurite, which can be used to upgrade the Crawler, upgrade flares, or produce dynamite that can open up extra areas to explore. In theory, it is possible for players to upgrade so that they can become solely reliant on flares rather than the Crawler. Azurite is automatically picked up as it is approached, as are all the loot items dropped by any monsters to avoid players having to micromanage items while exploring. The loot is then dropped for players to take their pick of at the end of the Delve. 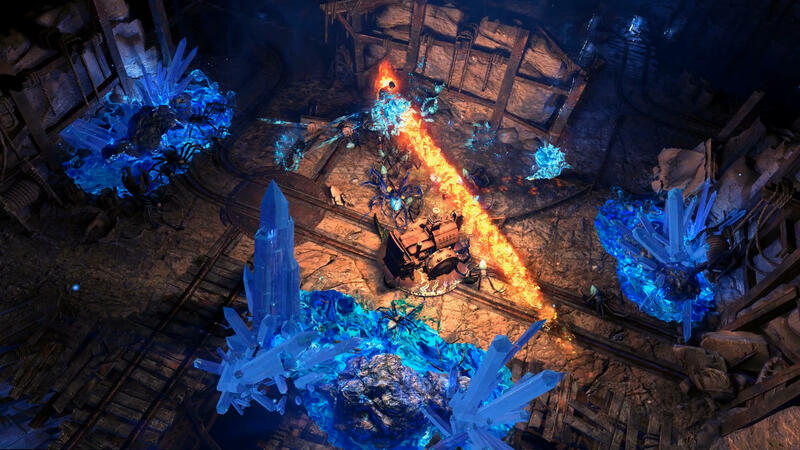 The end of the Delve also features a special encounter, usually involving waves of enemies and bosses. 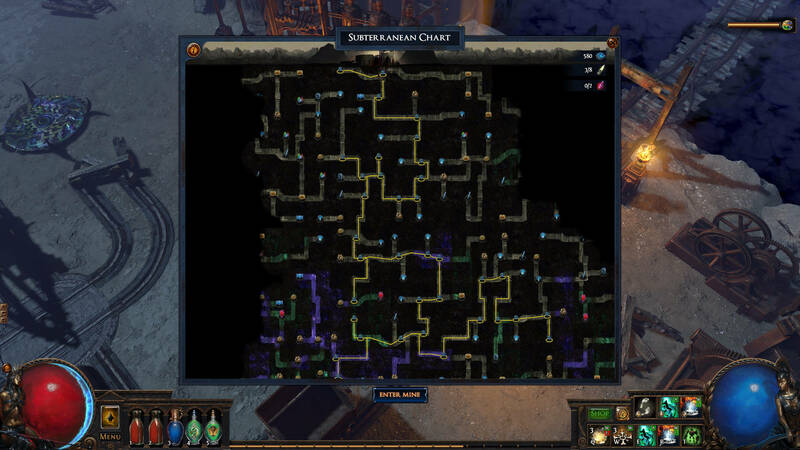 This encounter grants an extra reward and sees the area of the Delve connected to the others on the Subterranean Chart, which acts as a map of available Delves that can be accessed again in the future. 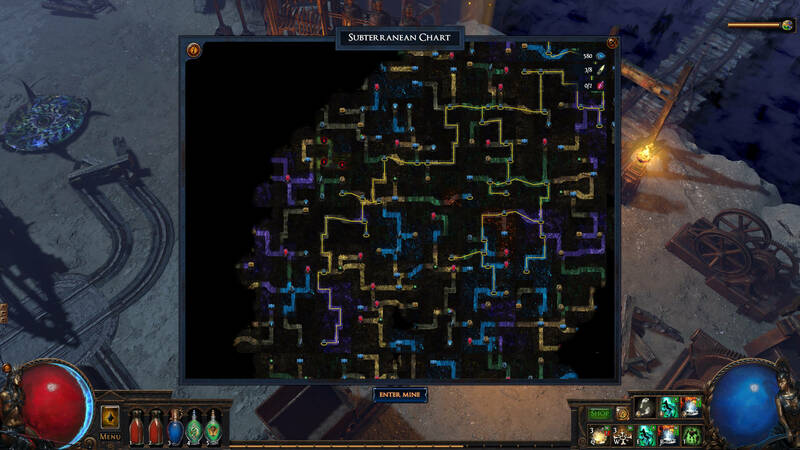 The Subterranean Chart is generated separately for each player and is infinitely scrollable left, right, and down. 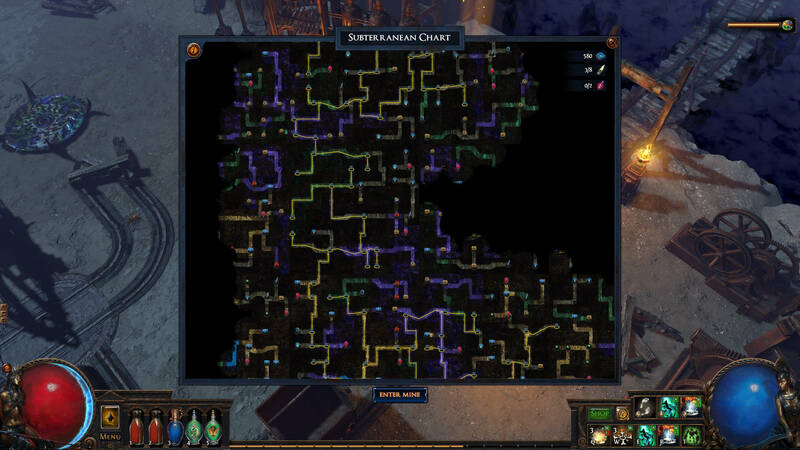 Nodes within a certain radius of where players have previously explored are automatically revealed and provide indications for what encounters, rewards, and biomes are present. The biomes help provide variation to delves, with lots of different area types including ice caves, petrified forests, and ancient ruins that have their own monsters, encounters, and bosses. As players travel deeper, the difficulty increases, so players may want to explore laterally to help build their character before delving into lower levels. The maximum depth that players reach is recorded on a leaderboard, allowing for competition between them. 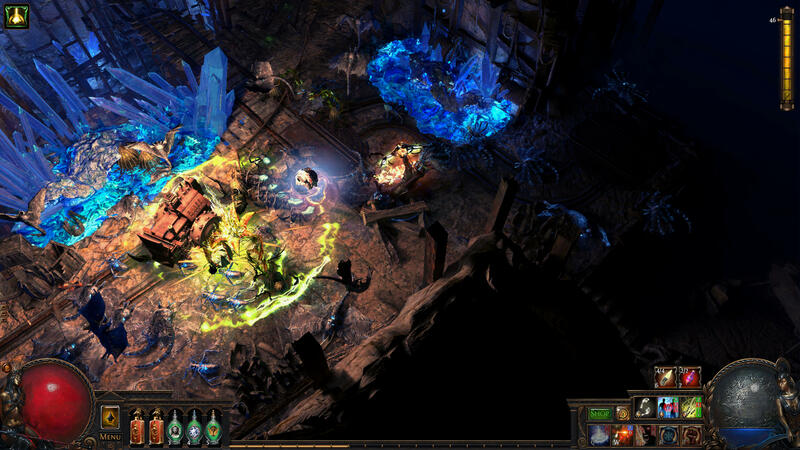 Delve also features some additions to Path of Exile‘s crafting system. 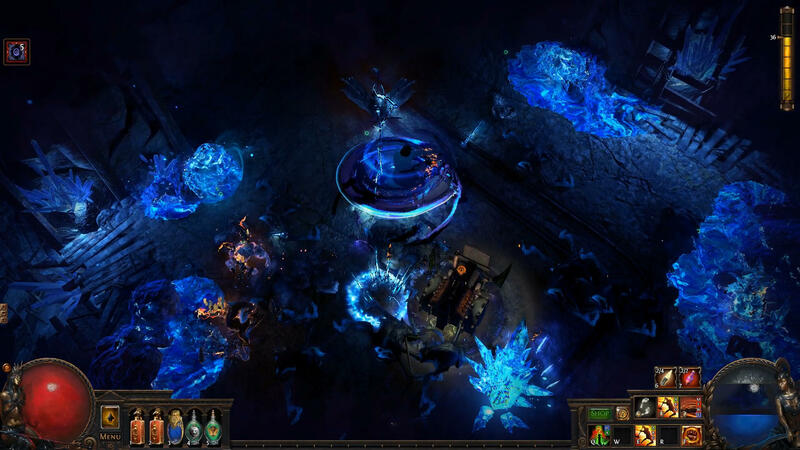 The traditional system for Path of Exile sees crafted items being modified randomly, but Delve lets players add a bit more control to the process. This is done through socketable crafting items and fossils which fit within them, providing constraints and adjustments to the type of modifiers that are applied to crafted items. For example, the Metallic Fossil adds a greater chance of lightning mods and removes the possibility of physical damage mods appearing. Some items have multiple sockets to fit Fossils in. As with other expansions, Delve also features some new and revamped skills. 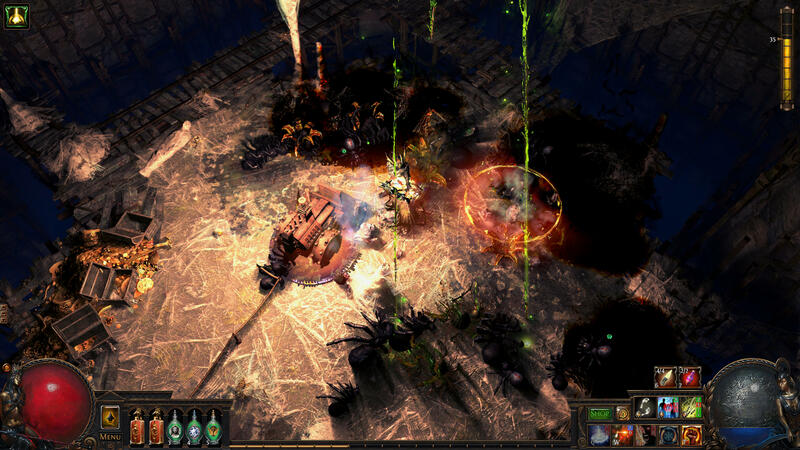 There are ten such skills in Delve, which can help create new character builds. One such skill is Smite, which attacks a selected enemy while also causing a bolt of lightning to hit another enemy nearby. It also grants a temporary aura that provides the player and allies additional lightning damage and chance to shock enemies. Meanwhile, the Toxic Rain bow skill creates pods that tether to enemies, slowing them down and dealing chaos damage until the pods explode. Delve also features eighteen new unique items, half of which are specific to the Delve content while the rest are focused on defining specific builds. There are also new Timeworn Reliquary Keys, items that open a portal to a special chest containing a Relic item. These let players gain items from past expansions and leagues that are otherwise no longer available in the game. 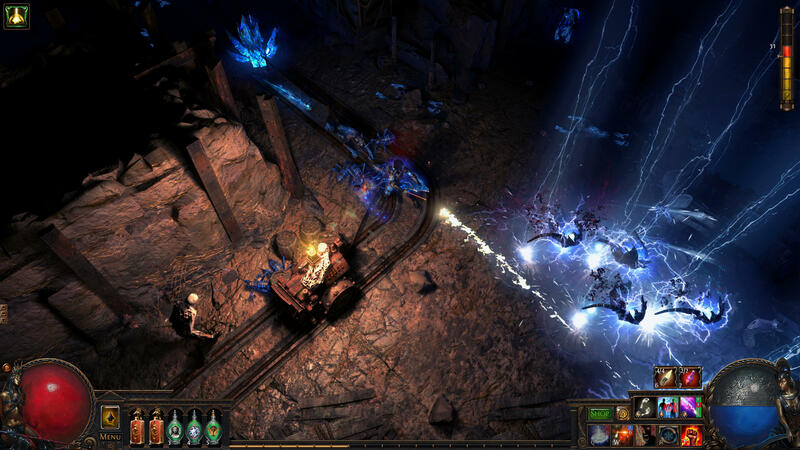 Finally, Path of Exile is receiving additional graphical enhancements. The tech improvements include big changes to lighting effects, without significantly increasing the processing power required, that add shadowed point lights — something particularly apparent in the Delve content — and allow for Global Illumination and Ambient Occlusion. Water also now features full physical simulation, providing dynamic water speeds based on the shape, foam effects, currents, eddies, etc. Certain pieces of monster art from early portions of the game have also been improved. 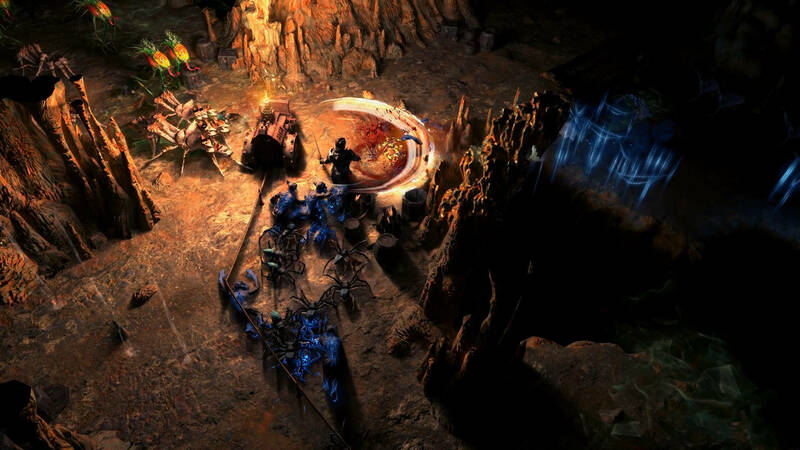 As with the game itself and all other Path of Exile expansions, Delve will be free for all players. The Delve content update will be released for PC on August 31, 2018, and for Xbox One on September 3, 2018.